How do I value my Timeshare? This article answers one of the most common questions about Timeshares by those individuals who are attempting to sell their timeshare on the resale market. What is my timeshare worth? 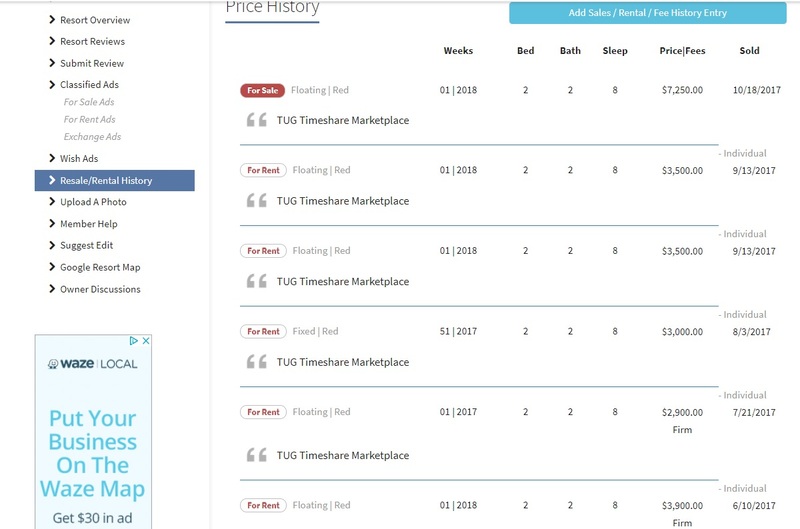 Many moons ago one TUG volunteer took it upon himself to create a custom sales history database that TUGGERS could use to input the historical sale prices and information about their purchases and sales of timeshare weeks/intervals. As of 2007 this database had thousands of entries in it. Sadly the entries into this database dwindled significantly and it had not seen any significant new information in many years. Thusly it was time for a change! In late 2007 TUG released its new member only system and with some other very impressive features included an integration within the resort review pages, is now a detailed Sales History tab allowing any and all TUGGERS to get a detailed view of all sales history records for that resort right on the review page itself. On top of this, since we had released the Timeshare Marketplace at the same time, we now take the data from completed listings in the Timeshare Marketplace, and automatically populate the Sales History tabs for each resort as they are sold! This combined with the entries from some very hard working TUG volunteers and their careful tracking of EBAY completed listings, the TUG sales history database has more than doubled in size, and with hundreds of new entries each month...it has become a leading source for owners to see what Timeshares have sold and rented for in the past! Ok thats great info, where else should I look? It is extremely smart to search in multiple locations to find an accurate resale comparison for your Timeshare especially if one hasn't sold on TUG recently! We put together this walkthrough video guide that shows owners a quick and easy way to search for resale comparisons in less than a few minutes! Once you have established the price other owners are currently listing intervals at your resort for, you can make an educated decision on how to move forward with the resale process! As always, we provide a step by step guide for How to sell your timeshare yourself and avoid being scammed, this article is free and open to the public! This is a detailed, step by step guide on how to get your timeshare sold yourself, for little or no cost to you...and more importantly...avoid being ripped off! This article discusses other options for obtaining an accurate resale price for your timeshare. This is a vital step in trying to sell your classified ad, as if you are attempting to sell your timeshare at an unreasonable price greatly above what other owners are listing the exact same thing for in the resale market, then you have little to no chance of selling your timeshare at all! Sadly this is indeed one of the main reasons that timeshare owners experience EXTREME frustration in their attempts to sell their timeshare, as many simply just do not know how to accurately price their timeshare in the resale market and then fall victim to an upfront fee resale scammer who convinces them to pay a large upfront fee! and of course another reason why we hear the phrase "I wish I would have found TUG earlier!"